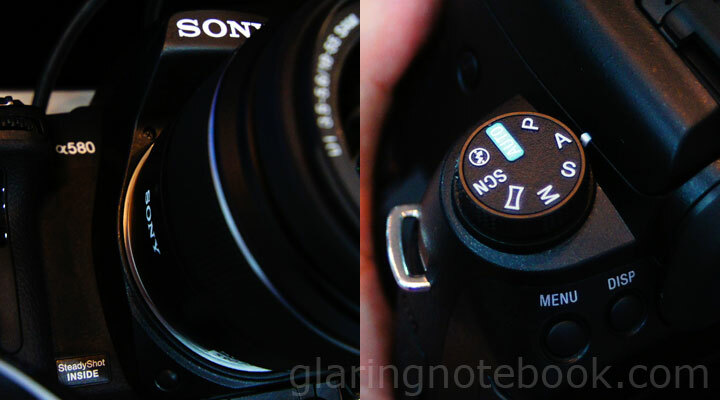 So I tried the Sony Alpha DSLR-A580 – the less famous cousin of the Sony Alpha SLT-A55V. Its sibling, the A560, was delayed to 2011. It has a real nice grip to it, with a nice embossed mode dial. The firmware is interestingly, Version 1.11. 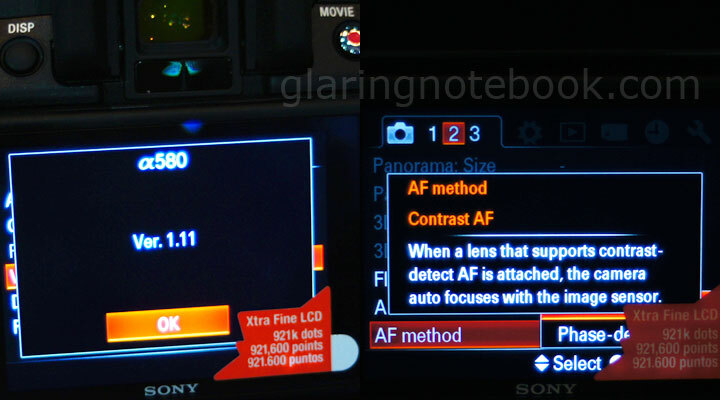 In the menu you can choose Contrast Detect AF or Phase Detect AF to be used in Focus Check Live View. In the A550, it was called Manual Focus Check Live View. Now that the camera can focus in main-sensor Live View (which is what Manual Focus Check Live View is, really) it had to change its name. Phase Detect requires that the mirror drop back down so it can direct light to the Phase Detect AF sensors in the bottom of the camera. Contrast Detect just uses the main sensor Live View to focus, albeit a lot, lot slower. At least the mirror does not move. I recorded a video to show this. A lot has been improved or brought back, but in essence it’s still an old concept, based on the SLR idea. Translucent mirrors like on the SLT-A33 and SLT-A55, however, are an interesting way to tackle the limitations of the SLR focusing/viewing design! This entry was posted in Geek, Pictures on October 22, 2010 by 2konbla. After trying both A55 and A580, it seems like the A55 is better buy due to many advantages it has over the A580. I can’t help it but to feel that the A580 had high chances of going back to the service center for servicing due to the constant vibration in the mirror box when using (HDR, Sweep Panorama, Phase Detect AF in Focus Check Live View). Scary wei when it does that. Bowdacious B: I didn’t think of it in terms of mirror actuations, but hmmm. That said I’m not worried about the mirror crapping out – if it does within the warranty period then it can be fixed for free.